It is no secret to anyone that knows me that I am not a huge fan of fall. Sure, there are a few things I enjoy about it. but to me it is quite simply a gateway to cold and yuck for several months. 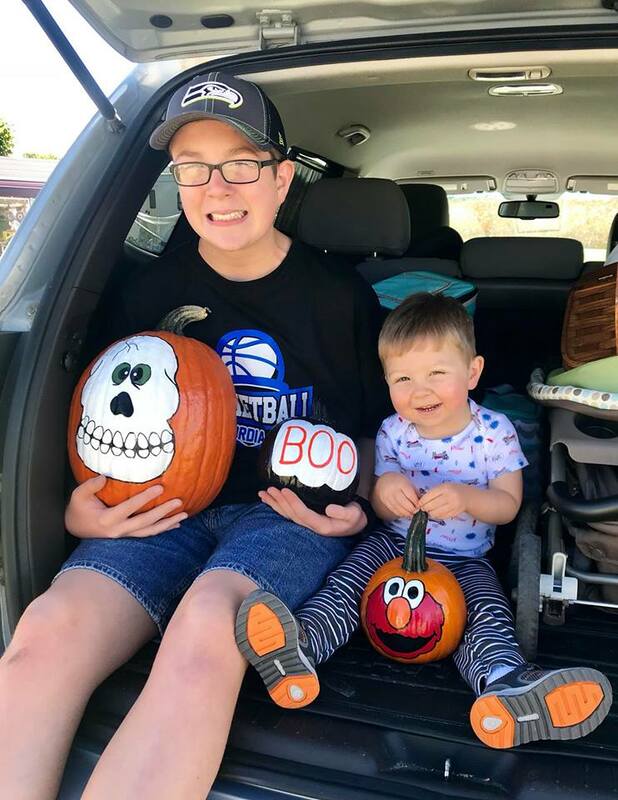 But when I'm trying to look on the bright side, and talk about the parts of autumn I do enjoy, I always mention trips to the pumpkin patch, picking apples, fall festivals, and the one thing these all have in common in our house. The fact that when we get home, there will be a big pot of soup, that has cooked all day, waiting on us. One of the simplest pleasures in life is walking in the house, after being outside on crisp day, and instantly being greeted by the smell of a delicious meal, and the warmth it brings. To show you I don't just talk the talk, but I walk the walk too, this was the recipe I made the day we made our annual trip to Neptune, Ohio for some of the cutest painted pumpkins around! About an hour away, Karen's Painted Pumpkins is a stand we discovered a few years back, and ever since we pick a day in fall, and make it a fun trip. This year's even included a snack at the ice cream stand, and some shopping too. Aren't those just the cutest? And yes, Mommy scored major points by asking ahead for her to make a "Melmo" one! This tasted SO good after our fun trip. It was a delicious end to a beautiful, fun filled day! I served some crusty bread on the side and it was simply perfect. Soup season isn't going anywhere, so having some new ones to add to your rotation is a must! Hopefully this one makes its way to your table soon! Add sausage, potatoes, onion and peppers to slow cooker. In a medium bowl whisk together broth, cream, corn starch, seasoning, garlic powder, salt and pepper. Pour over sausage mixture. Stir well to combine. Cook on LOW 5-6 hours. Stir well. (Don't worry if it separates a bit while cooking, just stir until it incorporates again) Turn heat to HIGH. Add cheese and stir until creamy and melted. Cook for about 10 minutes to thicken. Turn heat to warm until serving time. Garnish with extra cheese if desired. That looks SO inviting and delicious. Will be making soon. All your 'pumpkins'are SO cute! 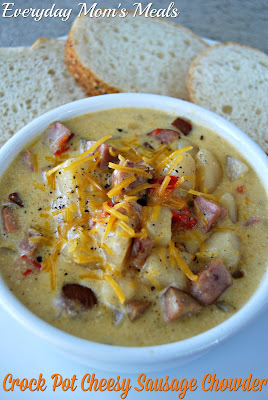 Making this very soon, I make soup a LOT, this sounds so good! Thanks! Sounds perfect! I have had a good soup in the slow cooker on my mind lately and it's just starting to turn cooler in the south, so I'll keep this is mind! Sounds like a fun day, and such cute pumpkins, including the children! Thank You! I hope you enjoy it as much as we did! Will this reheat well, want to share for lunch at work? It looks delicious...how many servings? Hi Sharlene, prob 6-8 depending on the size! Happy Thanksgiving!